It's official: Yahoo's days as an independent company are over. Verizon has agreed to pay $4.83 billion for Yahoo (YHOO), the companies said before markets opened Monday. The sale completes Yahoo's evolution from influential search pioneer and web portal juggernaut to, in the end, a once-dominant brand that lost its way. Parties as diverse as Warren Buffett and The Daily Mail were interested in buying Yahoo. But after a sale process that dragged on for months, Verizon (VZ), long viewed as the frontrunner, is walking away with Yahoo's more than one billion monthly active users. Current Yahoo shareholders will keep the company's lucrative investments in Chinese e-commerce giant Alibaba and Yahoo Japan. They will be spun into a separate, yet-to-be-named, publicly traded company. The deal also excludes some patents and Yahoo's cash. The Verizon deal must be approved by regulators and is expected to be finalized in the first quarter of 2017. The sale puts an end to Yahoo's 21-year history as an independent company. Yahoo will now be integrated with Verizon-owned AOL under Marni Walden, an executive vice president at the telecom company. It also ends a turnaround effort by Marissa Mayer, who joined Yahoo four years ago and promised to revitalize the company. Verizon and Yahoo have not commented on who will lead Yahoo once the deal is complete. It's unclear what Mayer will do after the deal closes. A spokesman for Yahoo said it's "too early to say" whether she will stay on as CEO, accept a new role at Verizon, or step aside. Meanwhile, Mayer says she will stay on to see Yahoo through its transition. "For me personally, I'm planning to stay," Mayer wrote Monday in a memo to employees posted on Tumblr. "I love Yahoo, and I believe in all of you. It's important to me to see Yahoo into its next chapter." AOL CEO Tim Armstrong told CNN's Poppy Harlow that he and Mayer are focusing first on getting "the strategy right, and then the structure and the roles right." "I've known Marissa for almost 20 years," Armstrong said. "The press has tried to make it a little more of drama camp, but we come from similar backgrounds." Related: Is it a mistake for Verizon to buy Yahoo? On a conference call with analysts after the announcement, Mayer repeated that line before adding, "A lot of the integration discussions are still ahead of us." Mayer also tried to frame the deal in a positive light on the call. She touted Verizon's potential to "accelerate our revenue stream in digital advertising" and repeatedly said she was "excited" for the future. "The single biggest thing this whole deal is about is scale," Armstrong told Harlow. "We will essentially end up being one of the largest portfolios of consumer brands in the world for digital." Mayer, like Armstrong, previously worked at Google (GOOG) before taking over the top spot at Yahoo in 2012. She invested heavily in improving Yahoo's mobile products, expanding its audience through the acquisition of Tumblr and doubling down on premium media content. She brought in TV journalist Katie Couric as Yahoo's "global anchor." But Mayer struggled to slow Yahoo's overall ad sales decline. After reporting earnings last week, Mayer made what may have been her final case to investors and the public that she worked to "create a better Yahoo." But the sale price suggests that Yahoo's glory days ended long ago. In 2008, for example, Microsoft (MSFT) was willing to pay more than $45 billion for Yahoo, an offer that was rebuffed by cofounder Jerry Yang. 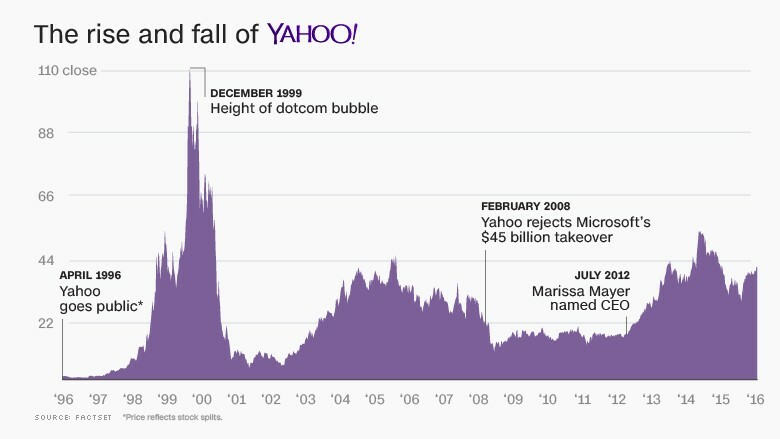 Yahoo was synonymous with the Internet itself in the late '90s. But for Verizon, the deal is about more than just nostalgia. The telecom company has invested in digital content and advertising in recent years, buying AOL and the Huffington Post. Investors were less than thrilled. Shares of Yahoo were down nearly 4% Monday afternoon.